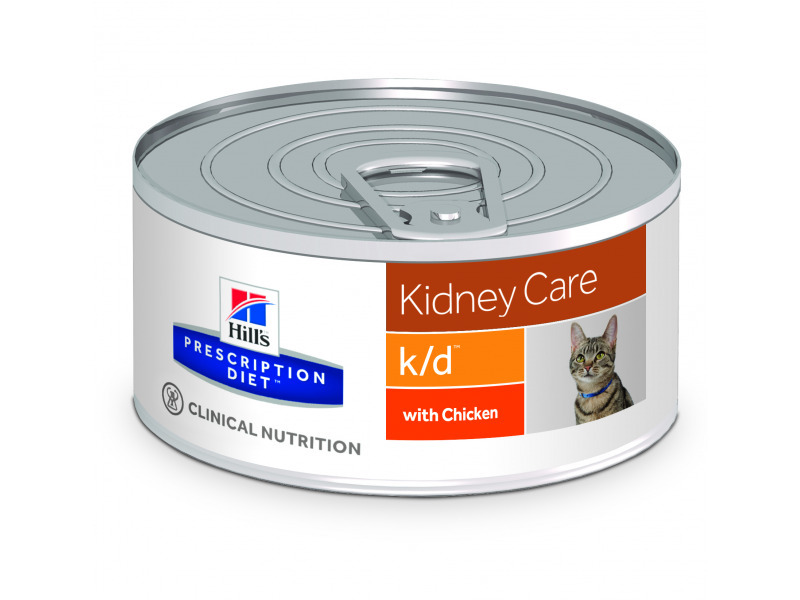 Prescription Diet™ k/d™ Feline is clinically proven nutrition to support a longer and better quality of life in cats with kidney conditions. The new formula offers vets and pet owners a new nutrition solution to support a common concurrent condition: cachexia (the loss of lean body mass due to disease). 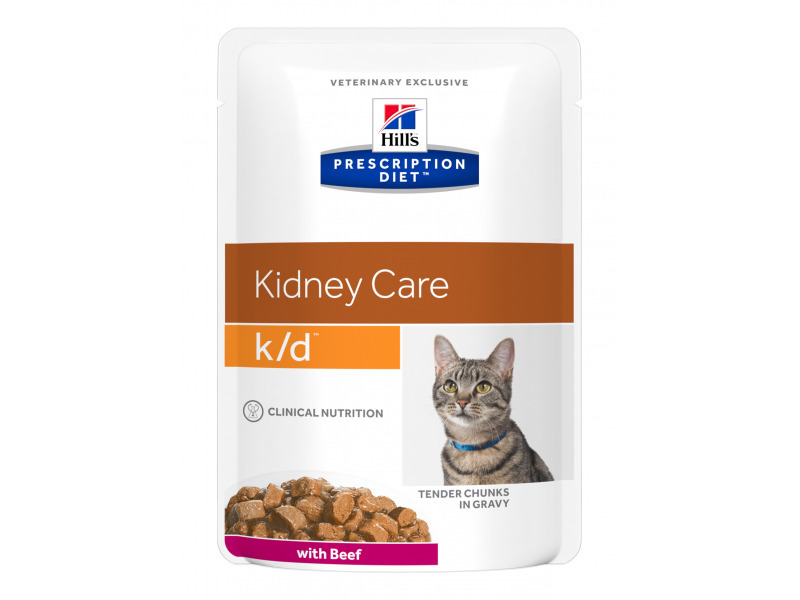 The core nutrition of k/d including high quality protein, controlled phosphorus and sodium remains the only renal dietetic food shown to increase length and quality of life in both cats and dogs with chronic kidney disease. The upgraded k/d has an enhanced amino acid profile, added L-carnitine, omega-3 fatty acids from fish oil, as well as an excellent taste profile to help combat CKD related cachexia. Dry Matter: Protein 29.5%, Fat 22.7%, Carbohydrate (NFE) 41.5%, Fibre (crude) 1.1%, Soluble fibre 0.81%, Crude Ash 5.13%, Moisture 4.7%, Calcium 0.74%, Phosphorus 0.49%, Sodium 0.25%, Potassium 0.75%, Magnesium 0.06%, Omega-3 fatty acids 0.90%, Omega-6 fatty acids 3.68%, Essential Fatty Acids 4.58%, ALA 0.30%, L-Carnitine 550mg/kg, Taurine 2.053mg/kg, Thiamine 12.98mg/kg, Riboflavin 10.05mg/kg, Niacin 149.74mg/kg, Pyridoxine 10.05mg/kg, Pantothenic acid 12.98mg/kg, Folic acid 1.99mg/kg, Vitamin B12 0.10mg/kg, Biotin 0.18mg/kg, Vitamin A 9.870 IU/kg, Vitamin D 1.012 IU/kg, Vitamin E 576 mg/kg, Vitamin C 94 mg/kg, Beta-carotene 1.6 mg/kg. Helps preserve kidney function as it contains a high level of antioxidants. Chicken, pork, beef (4%), maize starch, wheat flour, tapioca starch, various sugars, minerals and trace elements, vitamins, salmon, fish oil, animal protein powder, sunflower oil, pea protein concentrate. Coloured with iron oxide and natural caramel. Dry Matter: Protein 29.5%, Fat 22.4%, Carbohydrate (NFE) 40.5%, Fibre (crude) 2.5%, Soluble fibre 0.86%, Crude Ash 5.24%, Moisture -%, Calcium 0.71%, Phosphorus 0.43%, Sodium 0.24%, Potassium 0.86%, Magnesium 0.05%, Omega-3 fatty acids 0.86%, Omega-6 fatty acids 4.24%, Essential Fatty Acids 5.10%, ALA 0.19%, L-Carnitine 533mg/kg, Taurine 2.805mg/kg, Thiamine 12.86mg/kg, Riboflavin 10mg/kg, Niacin 150.00mg/kg, Pyridoxine 10mg/kg, Pantothenic acid 12.86mg/kg, Folic acid 2.00mg/kg, Vitamin B12 0.10mg/kg, Biotin 0.19mg/kg, Vitamin A 52,862 IU/kg, Vitamin D 786 IU/kg, Vitamin E 600 mg/kg, Vitamin C 100mg/kg, Beta-carotene 1.4 mg/kg. Chicken (17%), pork, wheat flour, maize starch, various sugars, salmon, dried egg white, cellulose, minerals, sunflower oil, fish oil, vitamins, trace elements, taurine and beta-carotene. Coloured with natural caramel. Dry Matter: Protein 29.8%, Fat 22.1%, Carbohydrate (NFE) 40.5%, Fibre (crude) 2.5%, Soluble fibre 0.86%, Crude Ash 5.24%, Moisture -%, Calcium 0.73%, Phosphorus 0.42%, Sodium 0.24%, Potassium 0.89%, Magnesium 0.05%, Omega-3 fatty acids 0.89%, Omega-6 fatty acids 4.32%, Essential Fatty Acids 5.22%, ALA 0.19%, L-Carnitine 534mg/kg, Taurine 2,653mg/kg, Thiamine 13.00mg/kg, Riboflavin 10mg/kg, Niacin 150.00mg/kg, Pyridoxine 10mg/kg, Pantothenic acid 13.00mg/kg, Folic acid 2.00mg/kg, Vitamin B12 0.10mg/kg, Biotin 0.18mg/kg, Vitamin A 61,022 IU/kg, Vitamin D 791 IU/kg, Vitamin E 600 mg/kg, Vitamin C 124mg/kg, Beta-carotene 1.4 mg/kg. These ranges are a starting point only, because cats' needs vary.Adjust the feeding amount to maitain optimal body weight. An 85 g pouch is equal to 19 g of dry food. with Chicken: Brewers's rice, animal fat, chicken (21%) and turkey meal, maize gluten meal, wheat, pea protein, dried whole egg, fish oil, minerals, digest, cellulose, soybean oil, dried beet pulp, L-carnitine, vitamins, taurine, trace elements and beta-carotene. With a natural antioxidant (mixed tocopherols). 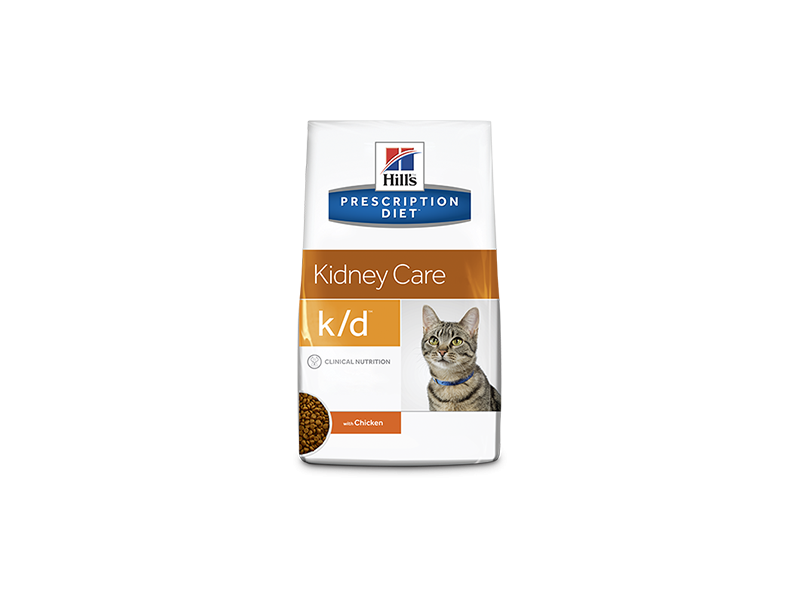 There are currently no questions for Hill's Prescription Diet k/d Kidney Care Cat Food - be the first to ask one!